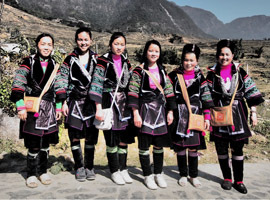 Sapa Hmong Family is a small family-run trekking operator in Sapa, Vietnam. We specialise in organising private trekking and sightseeing tours in and around Sapa. Our friendly and fluent English-speaking guides will show you the best spots and bring you close to the culture of the minority groups in this area. All of our guides are members of one of the many minority groups living in small villages around Sapa. Our goal is to offer authentic views into the life of the minorities and support the local people in need. We pay fair salaries to our guides to ensure they can provide their families and we organise educational projects for the local minorities. Contact us for more information or to book a tour, we will make your visit to Sapa an unforgettable experience.